The debate over the safety of electronic cigarettes has been raging on for some time now. Anyone (smoker or non-smoker) who wants to try e-cigarettes but is unsure of its safety, will do well to first understand what this electric device contains, and the by-products of vaping. Comparing these against the by-products of smoking tobacco cigarettes, can present a clearer picture about how safe it is to vape. The e-juice/e-liquid is the flavored/flavorless liquid that vaporizes inside the e-cig’s atomizer to produce smoke-mimicking vapor. Important thing to note here is vaping an electric cigarette does not produce actual smoke. By virtue of this, it becomes much, much safer than a traditional cigarette. Here’s why. Studies have proved that there are more than 5000 chemicals in tobacco smoke, of which over 50 are toxic, cancer-causing substances. Consider the electronic cigarette. It contains liquid nicotine in a specific concentration, propylene glycol (used in asthma inhalers and smoke machines), a flavoring agent and vegetable glycerin. All these substances are safe, and haven’t been linked to cancer or other serious health conditions. Now compare the contents and by-products of tobacco cigarettes against e-cigs. Common sense says that the latter is the much safer option. In other words, electronic cigarettes deliver nicotine to your system, help you combat withdrawal symptoms, and give you an enjoyable throat hit as well as the familiar sensation/experience of smoking a traditional tobacco cigarette. 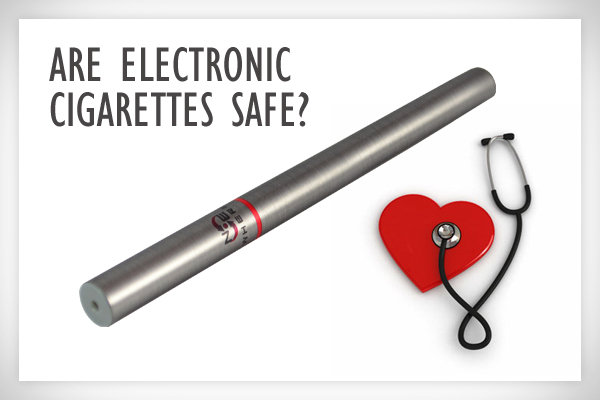 For a smoker trying to quit or limit his/her usage, an e-cigarette is the safer alternative. Does the nicotine in e-cigarettes pose a health concern? An average dose of caffeine – 85mg-250mg – can lower fatigue, ease thought flow and make the drinker more alert. A high dose of caffeine – 250mg-500mg – can cause nervousness, restlessness and insomnia. It can also result in cardiovascular instability and seizures. The concentration of nicotine present in e-cigarettes is not high enough to cause nicotine poisoning. Also, there haven’t been any reports of serious side-effects caused from vaping electronic cigarettes to conclusively deem their nicotine content unsafe. As an alternative to a tobacco cigarette, you cannot do any better than this electronic nicotine-delivery system. But e-cigarettes are not without their faults. From an objective point of view, electronic cigarettes can be potentially addictive, and there is no solid evidence to show that e-cig cartridges do not contain any harmful chemical(s) given that their manufacturing is not regulated. Electronic cigarettes were first launched in the market back in 2002. Till date, there have been no reports of these devices causing death or serious side-effects. This offers the confidence that vaping is a safe activity. Previous What is an Electronic Cigarette?